Before starting any configuration on your network equipment it is essential to protect it with passwords. Every single interface that you have on your router or switch has to be password protected. 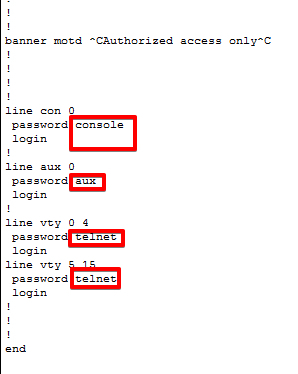 There are few commands regarding passwords – console, aux, telnet (vty) enable password and enable secret. Zeljko(config)#enable secret test1 – Sets the enable secret password to test1. Supersedes the enable password. Zeljko(config)#line line – Changes to line mode to configure the console, aux, and VTY (Telnet). 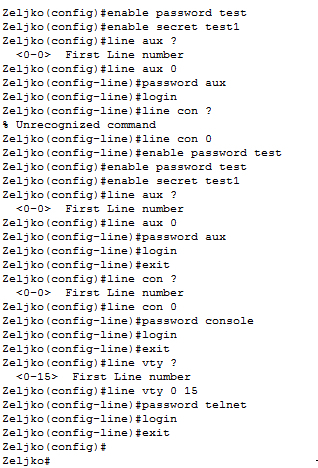 Zeljko(config-line)#password password – The line password for aux, console, and VTY (Telnet) are all set in line configuration mode. 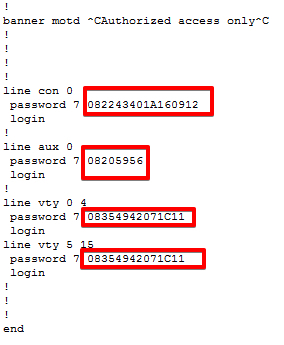 Zeljko(config-line)#login – When a line is configured to use a password, the login command must be set to prompt for login. 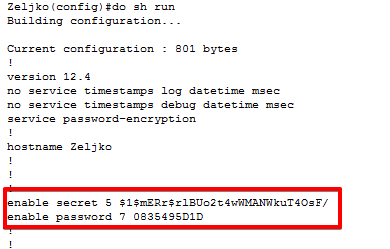 Zeljko(config)#service password- encryption – Encrypts the passwords in the clear text configuration file (both running-config and startup-config). To configure the inactive session timeout on the console port or the virtual terminal, use the exec-timeout command. When enabled on a console, logging synchronous causes all router status messages to be displayed on a new line.